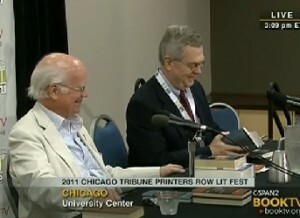 My only appearance at this year’s Chicago Tribune Printers Row Lit Fest was a good one: a chance to interview Dr. Martin Marty, professor emeritus of religious history at the University of Chicago, about his new “biography” of Dietrich Bonhoeffer’s Letters and Papers from Prison. It had been 7 years since I moderated a panel with Dr. Marty and Father Andrew Greeley at Printers Row, one of the most highly attended sessions I ever did at the book fair. The crowd was a little smaller this time and the venue was different: University Center on State Street, which hadn’t yet been built in 2004 (we did our panel that year on the first floor of a church, Grace Place). The book is one of three in a new series from Princeton University Press. We had hoped that we would be joined by Garry Wills, whom I interviewed in 2008 at the book fair; his entry in the series is a biography of Augustine’s Confessions. But we had an engaging 43 minutes in front of the crowd and the C-SPAN/BookTV cameras, so here is a link to the proceedings: Dietrich Bonhoeffer’s Letters and Papers from Prison] – C-SPAN Video Library. P.S. : If you just can’t get enough of these interesting literary discussions, I note with amusement that I’ve now been on C-SPAN enough to have my own page.